By this all men will know . . .
A well-known, intelligent “Christian” drops out. Read how she describes “Christians”. 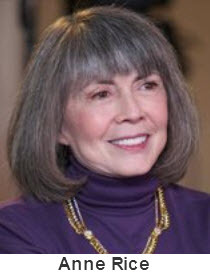 Anne Rice lived for decades as an atheist. Raised as a Catholic, she rejected the church early in her life but renewed her faith in recent years and in 2008 released the memoir Called Out of Darkness: A Spiritual Confession. The best-selling author of 28 books is probably best known for her Vampire Chronicle series. Twelve years after she converted from atheism to Christianity, she quit being a Christian. Where Are The Significant People And Why Don’t We Hear About Them? When was the last time you saw a headline like these? Note: In several recent posts and replies to emails and posts I responded to folks whose political and social views differ from mine. In some of those instances I responded with arrogance and often biting sarcasm. I’m troubled by what I see as an increase in the neologism, muslimophobia (fear of Muslims), in this country. It appears that many people associate the term Muslim with terror and terrorists. Any mention of Muslim activity for some, whether it be political, social or religious, ignites condemnation of all Muslims and fear of another nine-eleven attack.